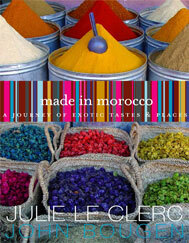 Made in Morocco will take you on a journey of visual and sensual pleasures. Food writer Julie Le Clerc was totally beguiled by the sensual harmony of traditional Moroccan food. Dishes that are savoury yet sweet, enigmatically spiced and intricately aromatic to the nose; tagines, b’stilla, delicate breads infused with spice, honeycomb pancakes and myriad couscous dishes. While Julie immersed herself in researching authentic cuisine to create a wonderful collection of new recipes, intrepid traveller and photographer John Bougen captured the spirit of this vibrant country with images that are unforgettable.